The post is under continious construction, last update: November, 2018. If you have any suggestions or feedback, you are very welcome to contact me using github issues, or at sergey.frolov@colorado.edu. This post is mostly about the client, but I will provide a few links to server configuration tutorials. Caddy ✔* ✔ RECOMMENDED. Configuration is extremely easy, see instruction from Caddy’s author Matt Holt in his blog post on Medium. 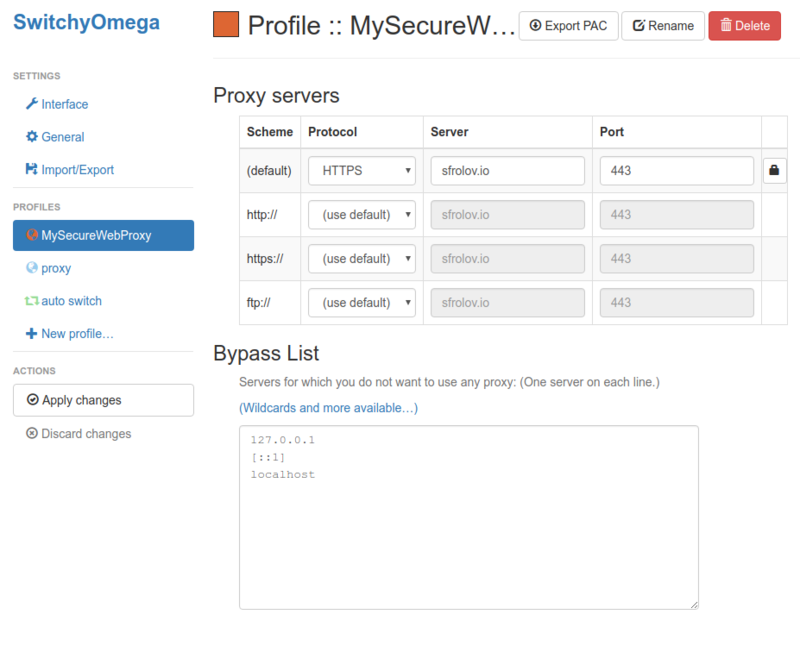 Apache2 ✕ ✕ See how to configure forward proxy on https://httpd.apache.org/docs/2.2/mod/mod_proxy.html. mod_proxy and http2 do not work together. Set up per-appilcation proxy. Recommended method. Use Proxy Auto-Config (PAC) file. PAC files are less common, but they don’t require special apps or extensions for browsers or mobile platforms and allow flexible configuration. Alternatively, you can pass --proxy-server="https://sfrolov.io" (substitute sfrolov.iofor your.server.com) to google-chrome. 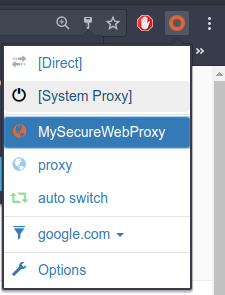 In Linux/MacOS you can call google-chrome --proxy-server="https://sfrolov.io". In Windows/macOS you can right click on icon and set up passing aforementioned string as argument. Easiest option would be to use SwitchyOmega. Setup is same as for Google Chrome, just follow the instructions. Don’t forget to substitute sfrolov.io for your.server.com, and don’t lose HTTPS%20 before and ";} after. You can also check “Do not prompt for authentication if password is saved” for convinience. Remember that you first have to generate PAC file. ForwardProxy plugin for Caddy web server does that automatically. You can also specify full path to local PAC file. Control Panel → Network and Internet → Internet Options → Connections → LAN settings → Check the “Use automatic configuration script” and specify url or path to your PAC file. System Preferences → Network → Choose needed network and click “Advanced…” → Proxies → Check “Automatic Proxy Configuration” and specify url or path to your PAC file. Introduction theme for Hugo. Made with and by open source contributors. Served by Caddy Web Server.